Lieder. It’s one of my favourite musical genres. Mozart, Bach, Schubert, and Schumann music were, for me, very intersting to study and sing. And I look forward to listening these music, as delivered by this duo of the male voice and warm guitar strings. TO READ MORE ABOUT THE LIED DUO, CLICK HERE. 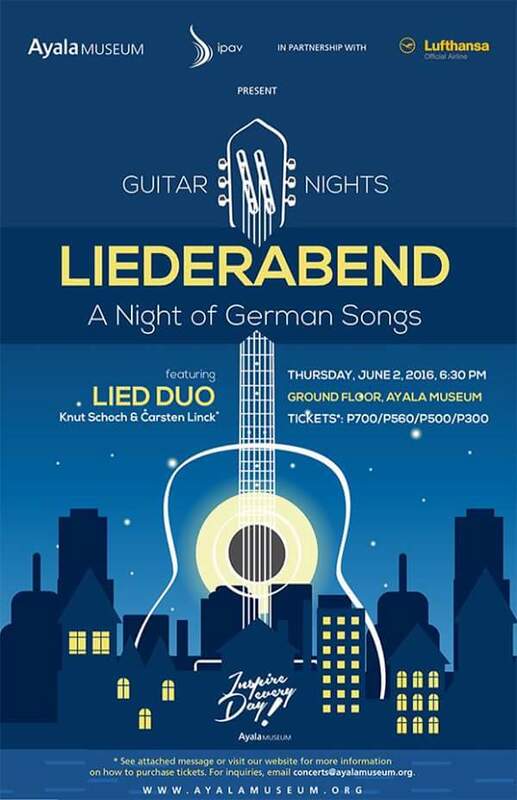 GuitarNights is a new addition to the list of musical experiences offered by Ayala Museum and Independent Philippine Art Ventures, Inc. (IPAV), gathering some of the country’s foremost and international classical guitarists, bringing the familiar and beloved instrument to a whole new light. Tickets are now available for sale at the Ayala Museum, Makati Avenue corner De La Rosa Street, Greenbelt Park, Makati, open from Tuesday-Sunday, 9 AM to 6 PM.Kindly present a valid ID to avail of applicable discounts.Cash payment is preferred.Limited seats available. In the event the maximum seating capacity is already reached, succeeding buyers will be duly informed of standing room only status and can purchase tickets at the minimum price (P 300).It is best to call 759 82 88 local 31 or 35 to get the latest update on the availability of tickets. Counter for unclaimed and/or unsold tickets (if any) will open on June 2, 2016. Gates will open at 5:30 PM.Ticket holders who were guaranteed seats (purchased before reaching maximum capacity status) during the sale period may sit anywhere. Please note that there are no seat assignments and that seating is first-come, first served.All tickets sold for the June 2, 2016 concert is valid only during said date.